Skull tattoos have always had a following, but as the symbol becomes more acceptable and understood, the number of devotees with skull designs is on the rise. What are the many meaning of the symbol of the skull, and where can you find a skull design for your tattoo? Read on and learn the truth behind the often misunderstood imagery of the skull. While a skull tattoo may sound like a very straight-forward idea, there are a number of ways you can design a skull tattoo. These range from the traditional to the more outlandish. The skull and crossbones is a common type of skull tattoo. While the skull and crossbones design has often been used to symbolize poison and death, especially when used on a pirate flag, many people no longer have the same negative reaction to seeing it, especially with the resurgence of pirate imagery. With the current romantic notion of pirates, the skull and crossbones tattoo is becoming more popular and less "frightening." 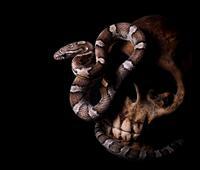 Another common subset of the skull tattoo is the serpent and the skull in which a snake is pictured emerging from the empty eye socket of a skull. The snake in the image is symbolic of a chthonic god of knowledge and immortality. The message behind this tattoo is that knowledge persists beyond death and the serpent has the secret. The Symbolism Behind the Skull? While once only considered a sign of rebellion, the symbolism behind the skull is often more positive than negative. In the Tarot deck the Death card, often pictured as a skull or skeleton, is a symbol of change - good and bad. The skull can show the victory of death over life and the transience of the human existence, but the negative impact can be tempered by the belief of some that part of a person's soul can survive death and triumph. At the same time, it can be a sign of machismo, proof the wearer of the skull tattoo understand and accepts his or her fate. The skull image is used in several religious cultures. The Indian god Kali is pictured with skulls in her wrathful form. Within the Kabbalistic tree of life, the skull symbolizes not death but rebirth and is a celebrated, not mourned. In Day of the Dead celebrations in Mexico, the skull is a reminder of death, but it reminds people that while death is a misfortune, it can also be seen as "the ultimate liberation." Not all meanings are positive, however. The Nazi SS used the death's head as a symbol and many neo-Nazis still use the symbol in tattoos to this day. Skull tattoos - and skull and crossbones tattoos - were once considered the domain of bikers and "low-lives," but as the meanings behind skulls are learned, and as tattoos rise in popularity, they have become more common. Celebrities, musicians and even "regular" people now wear their skull tattoos with pride. There is no age or gender more likely to have a skull tattooed nowadays, however, men may have more visible ones than women. Remember the skull you choose will have a meaning specific to your design. While many may view skulls as macabre, you now know these designs can sometimes be morbid, but are other times hopeful. Regardless of your reason for getting a skull tattoo, this is a design you will have on your body for the rest of your life.